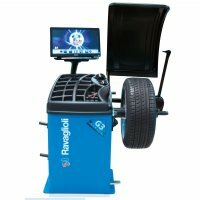 Turn any RAVAGLIOLI balancer into a Motorcycle Wheel Balancer with the HAWEKA Pro Bike Kit. Motorcycle manufacturers regularly launch new motorcycles in order to offer individual solution to any driver’s desire. New technical developments e.g. mono lever wheels, combined with modern designs have lead to much wider tires for motorcycles. HAWEKA is keeping pace with these technical developments and have made it their goal to react quickly to technical changes and to work on necessary solutions. The motorcycle clamping device Pro Bike has been constantly improved in recent years. 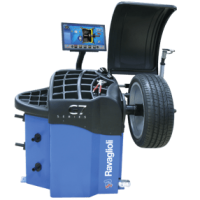 The HAWEKA's motorcycle adapter flansh kit fits all Ravaglioli balancer. RAV's 40mm shaft is replaced with the Motorcycle Clamping Device which includes centering cones, spacers and lock nut to center the motorcycle wheel. In stock and available for purchase.